The robust development pipeline at Alexandria’s Braddock Road Metro got a push forward Tuesday evening. 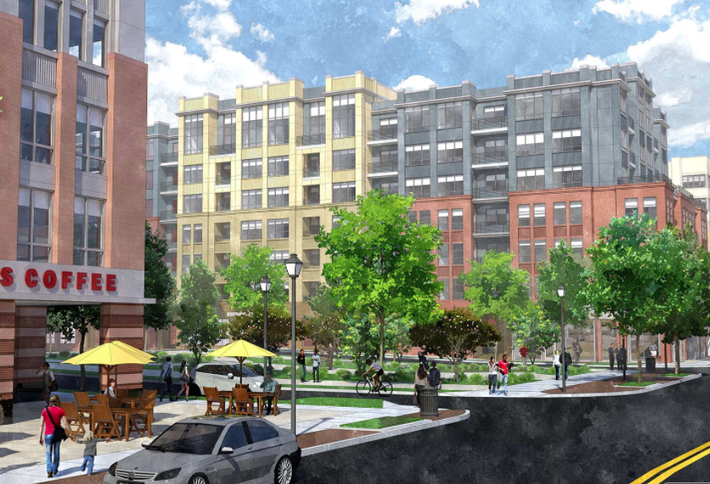 Alexandria’s Planning Commission voted to approved Phase 2 of Braddock Gateway, a 258-unit mixed-use building. Jaguar Development’s project will also include 8K SF of retail and a 28K SF park. Jaguar Development managing partner Eddy Cetina called the Phase 2 approval a big step. She said she expects to break ground in about 12 months after completing the construction documents and securing the building permits. After getting Phase 1 of the development entitled, Jaguar sold the parcel to Trammell Crow in 2011 for $14M. The developer brought on WashREIT as a partner and broke ground on the 15-story, 270-unit residential building in December 2015 with a delivery expected this year. The planned third phase would add a 317K SF mixed-use building with 250 to 300 units and 8K SF of retail, completing the seven-acre site. Next to Jaguar’s project, Avanti Holdings Group is planning a 100K SF development, likely multifamily or hospitality, on the site of an industrial property it bought last year. UPDATE, JUNE 8, 11:00 A.M.: While it originally partnered with WashREIT in the acquisition of Braddock Gateway Phase 1, Trammell Crow informed Bisnow that it has since replaced them with Meadow Partners in the deal.